We love to be dazzled by youth. Be it Zadie Smith's precocious debut novel, the Arctic Monkeys storming straight to No.1 or Lewis Hamilton tearing up the track in his first F1 season, we are consistently enraptured and delighted by the ability of the young upstart to reach heights to which they have no right and to let rip with flair and skill that is unencumbered by the fear of failure that haunts the more experienced. Can you remember Wayne Rooney announcing his arrival to the wider world? Sixteen years old and playing in the Premiership against the unbeaten Arsenal, but not afraid to strike from distance. Bang. Seaman's lying prostrate on the ground. Call the police, there's been a ram-raid. Rugby has a Rooney. He plays for Wasps. 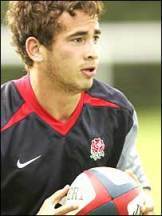 His name is Danny Cipriani and he has just been called up to the England squad for the first time. Danny made his own announcement in the first half of his club's Heineken Cup tie against Clermont Auvergne, last month. Only 20 years old, playing his first season in the No.10 jersey, against one of the top club sides in France and he spends forty minutes tearing through the opposition defence at will. Blistering pace, disco hips, great hands and he can kick as well. Heeeeeeeeeeeeere's Danny! He's a great looking kid, he's been romancing a Cheeky Girl, he's tumbled with a girl that was a boy, his mum drives a black cab. The pundits are drooling and a star is born. But here's the rub. Half-time in that game against Clermont and Han Solo was absent in the dressing room, where he would have been expected to shout in Cipriani's ear 'don't get cocky kid!'. In the second half, mistakes were made, a bonus point was lost and skipper Lawrence Dallaglio let it be known that he was less than pleased. That's youth for you. That lack of fear can cut both ways. So what price will Brian Ashton put on daring and invention? Does he pitch Danny in to run the risk or stick with the beautiful machine, Mr. Jonny Wilkinson? Ashton has not ripped up his squad and pitched in the youngsters, as some felt he might. He has stuck by a whole heap of experience and picked a side to win the Six Nations, rather than one with building for the 2011 World Cup in mind. Which is fine and dandy in our book. So expect to see Cipriani to come off the bench and try and weave some magic and then, maybe, we'll see if a Rob Andrew v Stuart Barnes style fight for the England fly-half position might begin to develop. Young Danny must beware though, for if he falters at any stage, there are plenty of hotshot playmakers waiting for their chance to challenge Lord Wilko. Charlie Hodgson is back in form for Sale and two other thrusting young bucks, Ryan Lamb of Gloucester and Shane Geraghty of London Irish (remember him ?) are biding their time. A final word on that England squad. It represents mixed fortunes for the Londoners. Tim Payne, Simon Shaw, James Haskell, Joe Worsley, Tom Rees, Cipriani and Paul Sackey make up a sizeable Wasps contingent (will there be anyone left at their training ground?) but stalwart Josh Lewsey is bombed out. The Quins trio of Nick Easter, Andy Gomarsall and David Strettle are in, but nothing from Saracens, with Farrell being dropped and no luck either for the London Irish. In other news, Spurs dominate Arsenal but still can't beat them. Dimi Berbatov shouts 'who me? Agitating for a move? never! '. And Pro-Zone can't save Big Sam from the chop at Newcastle.